Having good skin is a whole process, and honestly it can be the most daunting thing when you see commercials, Instagram ads, magazines, and bloggers (lol guilty) talking about what 200 step makeup routine you should try to get ultra glowy, blemish free, photoshopped skin only to find out that each product costs anywhere between 20 to 40 dollars (maybe even more) to procure. Well let me tell you...I'm not doing that today. Today I will be showing you 5 of my favorite beauty products that won't break the bank, but still, have my skin feeling fresh. My first go-to product is these facial wipes from She Moisture. Now I already depend on She Moisture to keep my hair together, but it's great that I can also trust this brand to keep my face moisturized and clean as well. The first time I actually heard about these was from Zendaya, and I'm glad I took her advice and purchased them because they have been very good for my skin. While other facial wipes can be a bit harsh on your skin and maybe leave it feeling dry; These remove dirt without drying out your face. They are also specifically made for oily and acne-prone skin, something that is great for my combo skin. As well as the amazing skin benefits, this product is also cruelty-free, organic, biodegradable, and a fair trade product. So glowy skin with a great cause! Next, we have Thayers Witch Hazel in Rose Petal. A particular favorite of mine, I've been using Witch Hazel as a toner since I was a teen. The best part about this one though is the fact that it has an Aloe Vera formula which hydrates the skin. Just put some of this on a cotton pad sipe it on your face to feel refreshed and ready to go. *Pro-tip for buying toner, make sure that it is Alcohol-free because if it's not then that toner will dry out your skin, leading your face to overproduce oil. This may in turn cause breakouts. Basically, it's a slippery slope, so just remember Alcohol-free. Eye cream? Ari, you're only 22 why are you using eye cream? Well, my wonderful readers, I may only be 22 but I defs think your 20s is the time to start thinking about investing in products such as eye cream. 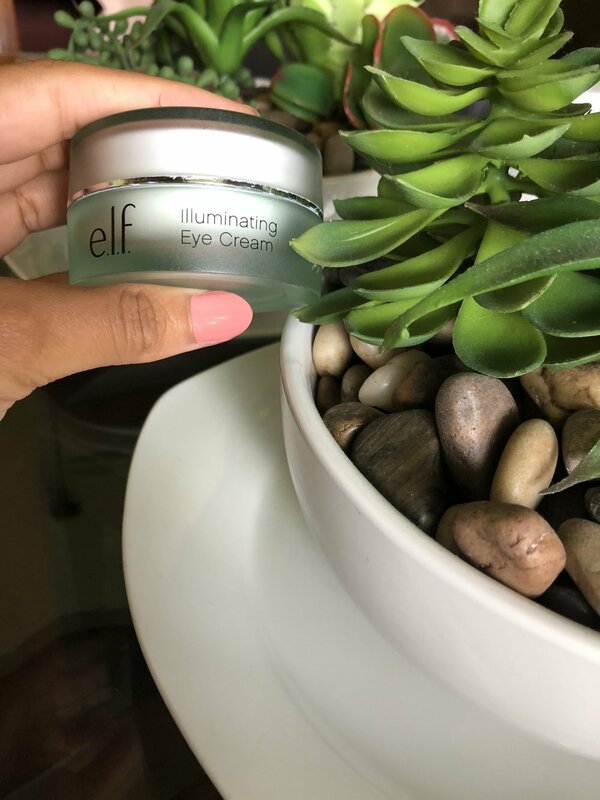 Unfortunately, eye cream can be crazy expensive, but thanks to my favorite brand E.L.F. they have made it more affordable for young 20 somethings like me, just starting out in their career. This particular one hydrates your under eyes to minimize dark circles and puffiness and has worked really well with me. Now I have been using this moisturizer since I was in high school, and even though I have tried others, this one is the one I will ALWAYS go back to. This particular moisturizer is oil-free and includes soy to promote and improve evenness, tone, and texture of your skin. *Pro-tip for finding a moisturizer, make sure that it has sunscreen in it. I don't care what skin tone you are or if you've never had a sunburn in your life. Skin protection is important, and you need to be using sunscreen in order to lessen the sun's harsh effects on our skin. Even if it's not a sunny day or it's overcast, having sunscreen in your daily moisturizer is still important because UV rays are usually strongest on days like that. This one, for example, is SPF 30, and you should be using 30 or higher for proper protection. 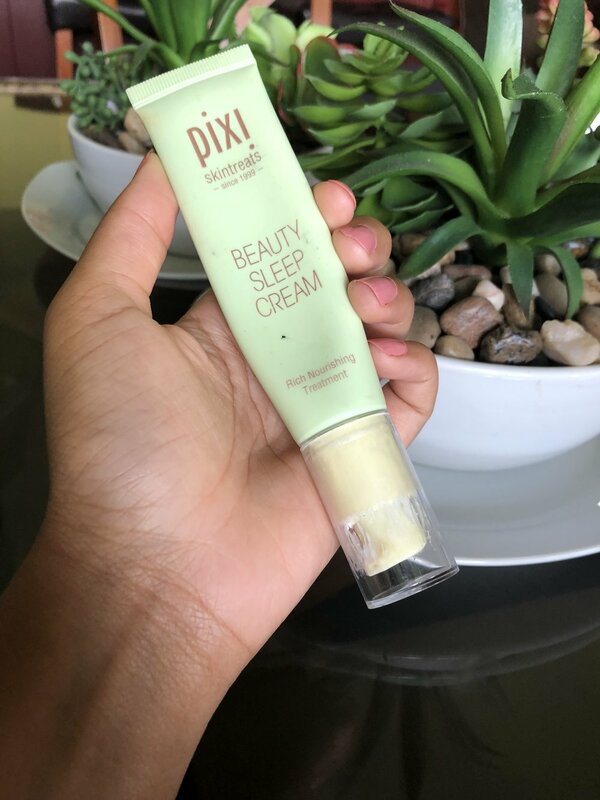 Finally, we have my night time moisturizer from Pixi, a brand that I have become obsessed with this past year. Now, even though I use and am in love with their Glow Serum and Jasmine Face Oil, this sleep cream is what I will always use every night. It's incredibly lightweight and oil-free so I don't feel like I'm suffocating my skin after I just cleaned it. Even though this is defs on the higher end of the price range ($24.00) it is completely worth it. So yeah! Those are my favorite face products that help keep my skin feeling fresh and glowy. If you want to see my total routine then comment below and let me know!